Hello and happy Friday. 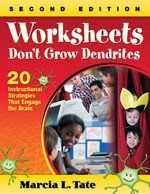 I have been conducting professional development sessions recently on Worksheets Don't Grow Dendrites and they have been going really well. I was introduced to the author Marcia Tate my first year of teaching. We began a book study and she came to the campus I was teaching at on a Saturday. We had the best Professional Learning I have ever been to. In the last 11 years I have had the opportunity to go to four of her training's. She is phenomenal and the best presenter I have ever had. Even after 11 years I continue to use her Brain Based Learning strategies and activities with my students and teachers. I have had wonderful success with raising student achievement and motivation with the 20 strategies she presents in her book. Mrs. Tate has grown since I met her ten years ago and now she has quite a few books out now. They are all equally wonderful! In each session I like to go over no more than three 3 strategies because with focusing on just 3, teachers are able to get an understanding of the strategies, what they look like, how to implement them, and how to modify if needed. When doing an activity, you will quickly learn that one activity could have multiple strategies in one...WINNER! Today I am going to focus on the brain based learning strategy "Movement". When the body is engaged during learning, the information can be put in one of the strongest memory systems - procedural or muscle memory. That is why people tend not to forget how to drive a car, ride a bike, or play the piano, even if they have not done so in a while. Rather than having students sit while their teachers do all the work, having them up and actively engaged in the content not only goes a long way toward ensuring that they pass any tests but that they will remember the information long after the test is over. Tate, M. L. (2003). Each person gets a paper which includes statements taught in the classroom setting. Each statement will be blank. Each participant will need to find someone who can answer the statement and initial. Each person must find 12 different people to answer and initial. Below you will find the activity and template that provides more in depth directions. What I like to do when I present this strategy and activity is to do a, "What could be modified?" part in the PL to see what we could do to make it better. It is suggested that if a student comes across someone who does not know the answer, they should just not move on to someone else. They should make that person their "Learning Buddy" and search for someone who knows the answer. The purpose of the activity is for everyone to gain knowledge and work together. 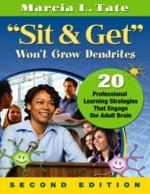 If you are a professional development/learning trainer, you will love her book Sit and Get Won't Grow Dendrites. This book is top notch and I use it frequently as a professional development trainings. I hope you enjoy the strategy and the activity.